Last September, I shared a my personal plan to purge every single space in my home before the New Year. 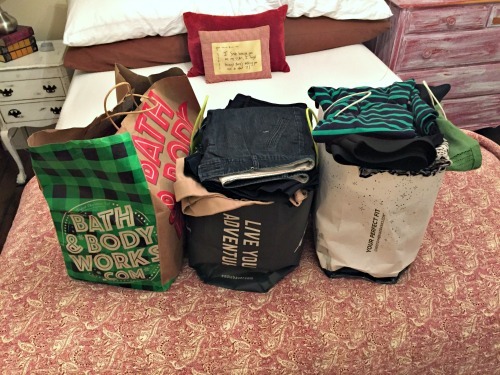 My goal was to choose one space per week (roughly 16 spaces in the remaining 16 weeks of the year) and focus any extra time or energy I had throughout that week on purging and better organizing the designated space. When the week was up, I moved my time, focus, and energy to the next space. 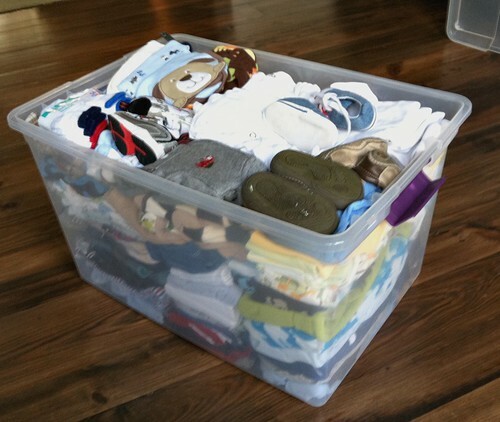 No, my house wasn’t perfectly purged or organized… BUT it was hugely beneficial for me to do a “once over” of our entire house, decluttering and purging as I had time, and making more breathing room for the inevitable Christmas gifts we would get at the end of my 16 weeks of purging! Here’s the original challenge post. 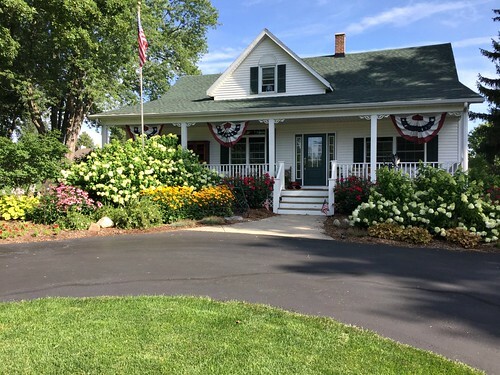 After I finished the challenge, I realized just how much stuff I had removed from our home with seemingly very little “extra” work, time, or effort (I was just doing little bits and pieces throughout the day and week). I also heard from SO many of you who not only followed along with my purging, but also did YOUR OWN version of this 16-week purge! It all felt so exciting and “do-able” that I decided I should make this a regular occurring event every fall! But then, I realized I could actually do a 16-week challenge THREE times a year (with 4 “free” weeks for vacations, illnesses, holidays, etc.). I would essentially start right back on the first room after I finished the last room, and make my way through our entire home 3 times each year. BUT THEN… I got even more ambitious and decided that instead of just purging the space, I would purge, deep clean, organize, and “better” one space in my home each week! I know this might sound overwhelming… just hear me out. I do NOT spend huge amounts of time stressing over making each space in my home perfect. Instead, I take any extra and available time I have throughout the week and focus it on that specific week’s space. Sometimes this is a lot of time; sometimes it’s hardly any time at all. However, I figure that whatever I can do to purge, deep clean, organize, and better that space is more than if I didn’t do anything at all! At the end of the week, I say “farewell” to that space and turn my time and efforts to the next space, no matter how far I got or how many things I still wanted to do. I know I will eventually come back to that space in a few months and can do more later. By faithfully giving a little extra attention to one specific space each week (while still carrying on with all other household chores and responsibilities) I have a better handle on what is in each space, I’m reminded of everything we have, and I feel like my entire home is cleaner, less cluttered, and more organized without lots of extra effort! No, the house isn’t ALL clean and decluttered ALL at one time… but with 4 little kids and a work-from-home job, that’s not possible for me! Maybe once the kids are in school (or once they are all married!) — but for now, I’ll take what I can get, doing a little bit each week! I started in the mudroom and kitchen because those are the spaces I’m in ALL the time and I like the instant gratification of living in cleaner, less clutter spaces. Then I worked my way through the main floor, then to the upstairs, then to the basement, and finally out to the garage. As I purge items from our main floor and upstairs, I usually put the boxes of donations in the basement or the garage (and then bring them to the thrift store the next time we go). So by putting the basement and garage last on my list, I can make sure I get all the donated items OUT of our house for good before going through the house again! Once I know what my space is for the week, I make a conscious effort to try to find ways to be in that space more each day. Obviously, rooms like the kitchen, living room, play room, office, and even the garage are relatively easy since I’m home most of the day. 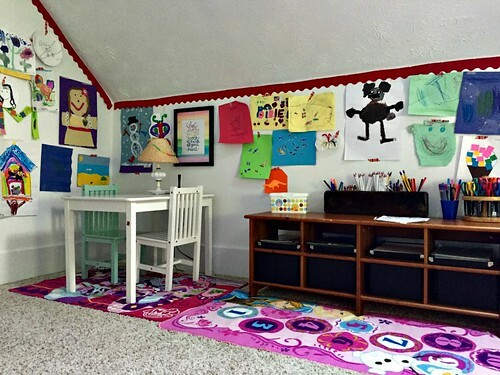 I can work in the space while the kids play, while they eat, while they look at books, or while they watch TV. Other spaces (like the bathrooms or the upstairs storage closet) aren’t as easy as they aren’t places I want our kids to hang out while I try to clean and organize! In these spaces, I either wait until Dave is home, work when the kids are sleeping, or set a timer for 20 minutes during Clara’s nap and let the boys watch a TV show while I do quick bursts of purging and deep cleaning! It’s not a perfect system, but so far, it has really worked quite well and I’m thrilled with the progress I’ve made throughout our home these first 13 weeks of the year. NOTE: Ironically, the week I was working in our playroom, we were given a HUGE assortment of LEGO’s from church friends — more toys! 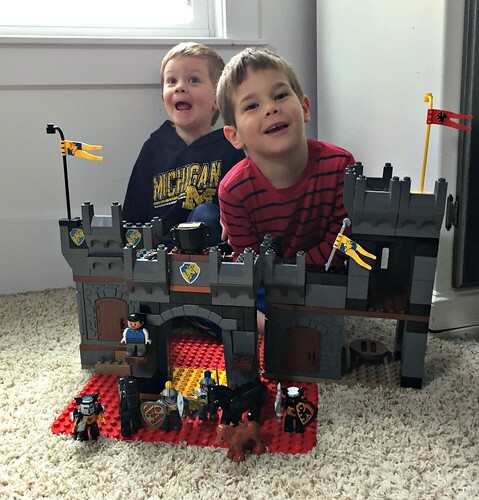 However, it ended up working out so well because I put all the LEGOs in the living room and let the boys play to their heart’s content while Clara was napping and I tackled the playroom! After I was finished, we had plenty of space for our new bins of LEGOs! 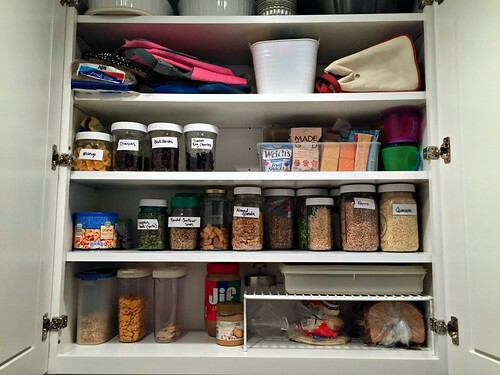 purge each drawer, cabinet, closet, shelf, etc. scrub sinks, toilets, showers, appliances, etc. Now, I certainly do NOT complete every single one of these tasks for every single space every single week. This is just my mental guide as I work through the spaces. I do as much as I can, and call that “good enough” — and as I mentioned above, it truly is so much better than not doing anything at all! Also, since I know so many of you reading today are perfectionists, I have to mention that I do not keep track of what I do and do not do for each space — that’s way too tedious for me! I just do whatever I can to better that space for a week and then move on. 1. The obvious bonus is the fact that I’m “touching” and “seeing” every space in my home 3 times a year — this means no more junk that gets lost in the back of the closet, no more nasty food growing in the back of the fridge, no more dirty windows for 3 years because I always say I’ll get to them “soon”! 2. Another benefit is that I’m constantly keeping tabs on what we have, what we use, what we don’t use, what we might need, etc. This has been most helpful with kids clothing, freezer food, and pantry stockpiles. 3. And finally, I stay in the habit of bettering my home. Deep cleaning and purging is no longer something I have to work up my energy to tackle, wait until Dave has a break from school, or spend huge amounts of time trying to work through my entire house in one week. I just consistently do a little at a time, and know that eventually everything gets done without huge amounts of mental or physical energy. 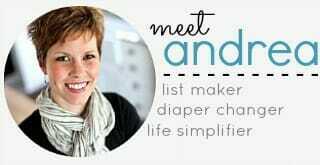 If you work outside the home, or if you’re starting with a very cluttered, dirty, and disorganized home, this system will not work as seamlessly for you as it does for me. However, there are still many ways you can adapt it to work for you, your home, your schedule, and your life. My suggestion is to first TRY doing it “my way” for a few weeks and see how it goes. Then make changes and tweaks accordingly. If you know you have a carpet cleaner scheduled for one week, use that week either as an “off week” if you think you won’t have time for other cleaning, or use it as a great excuse to thoroughly deep clean the carpeted rooms in your home (I usually try to tackle our living room if we have the carpet cleaner come). Or, if you’re having a huge dinner party at your home, use that as motivation to spend some extra time and effort cleaning and decluttering your kitchen and dining area. 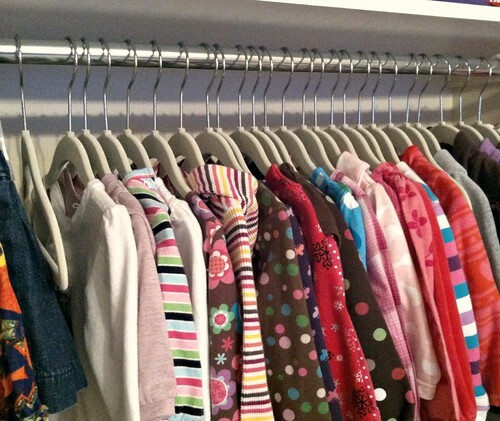 If your kids are rotating bedrooms, or if you’re swapping out clothing at the change of a new season, use that as a reason to go through their bedroom, closets, dressers, etc. and purge, better organize, and deep clean. There is NO RIGHT WAY to do this — it’s all what works best for YOU! I hope that by sharing what works for me, you will get a few ideas (and maybe a bit more motivation) to simplify and better organize your home and life! Love this idea! I’m curious – you mention fixing stubborn windows – how do you do that? I have a few of those, too. I like this so much. What I really need to work on first is the “conscious effort” part. I realize that my day is gone if I don’t think exactly what I need to do. These tips here a gold….as always…. 🙂 Thanks a lot! and yes, the “conscious effort” part is often the hardest for most people — no matter what you’re trying to accomplish! 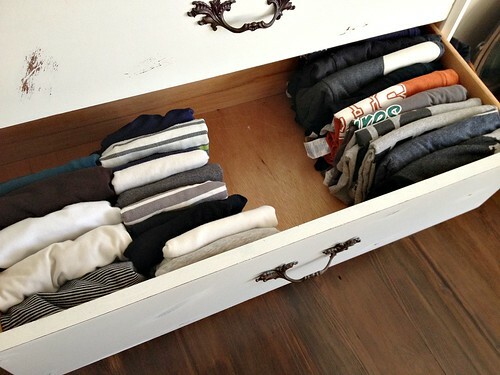 When do you squeeze in the time for this type of cleaning/organizing? I love your posts on time management. You are so inspiring. I work 50+ hours out of the house, but purged my closet on this Sunday afternoon. I think you just answered your own question though — I’m home ALLLLLLLLLLL day long, so I have tons of time to squeeze in all these little extra projects. If I were gone all day, it would be much trickier! Yay for purging your closet!! 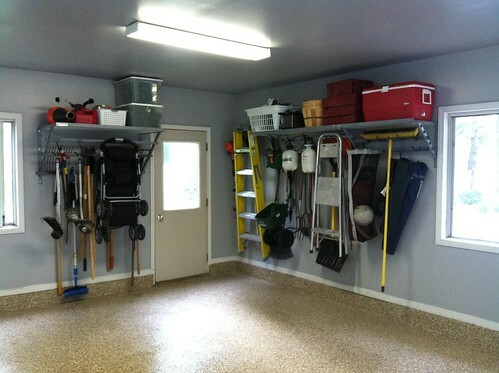 Can you do a post on your garage? We are looking into re-organizing our garage and don’t know where to start. We just moved in a few months ago and have done nothing to our garage. Do you like your floor? Why did you choose it? What about your shelving? Any advice is appreciated. Thank you! Hi Andrea, I love your suggestion about when my allotted time for a particular room is up, just move on no matter what’s still remaining. That really keeps the momentum and progress on track. yup, just keep on moving — so as much as you can, and then leave the rest for later. Otherwise, you get bogged down by the little details! I’m discovering that I am losing my perfectionist tendencies as I focus on progress instead. Believe it or not, you WILL reach a time in your life when there is literally NOTHING left to clean/organize! Our empty nest has left me with lots of free time and nothing to organize. LOL! Hang in there. There will come a time when you can relax and enjoy all those years you stayed on top of the decluttering and organizing! 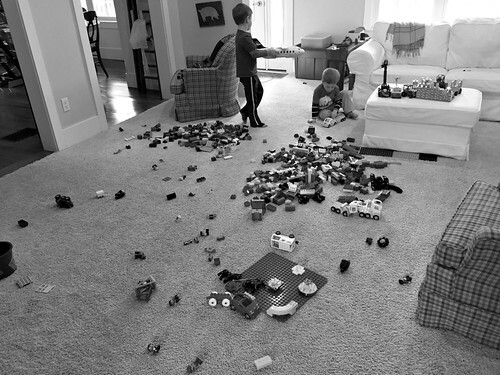 yes, I can totally see this happening to me too — it will be fun to be able to enjoy an organized space for more than 20 minutes before it gets cluttered up again! for now, I’ll just keep regularly purging ALL THE TIME! I just started doing this. I used to have my home on an 8-week rotation with a specific task each day of the week for each zone. But I found that it was too regimented. By the time I got back around to Zone 1 it really wasn’t too bad and I found myself cleaning things that weren’t really dirty. Now I’ve broken the house up into 14 smaller zones and I try to “spring clean” each zone each week. It doesn’t take long and there are no specific tasks. Just make it look better. I’m thinking this is a cleaning routine I can stick with. this sounds almost exactly like what I’m doing — glad to hear it’s working well for you too! 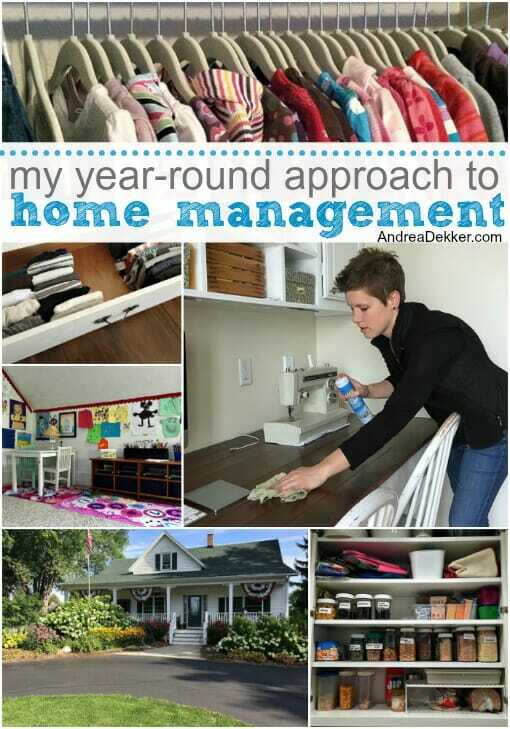 This is very similar to the FlyLady system I’ve used for years – key tasks you do each day and week to keep your house picked up and generally clean, and focus on once space each week to declutter and deep clean (After you’ve done that initial purge!). I love the approach because it means I only clean 2 windows in a bedroom versus feeling overwhelmed about cleaning 24 in the whole house! And when you realize how much you can get done in just 15 – 30 minutes, it really gets the momentum going to stick with it daily. We just moved so I fell out of the habit (just surviving is good enough in those insane weeks around a 600 mile move!) but this post is really reminding me to get back on the horse! I have been looking for a printable with a system like this that goes systematically through the house. I was wondering if you had thought about making this a printable? I have been following you since your pregnancy with Nora! Thanks for all of the tips. I probably will not do a printable with this, mainly because I don’t like making (or the idea that I’m adding paper clutter to people’s homes0. 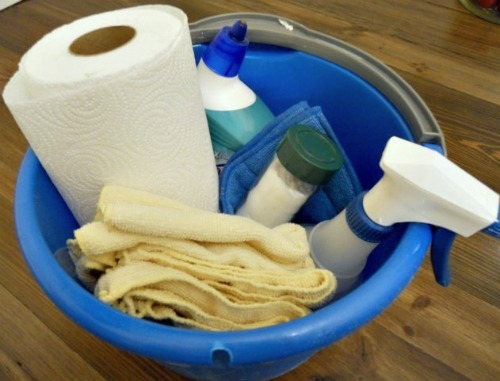 But also because the functionality of the printable is dependent on what rooms you have in your home and what types of cleaning needs you have. 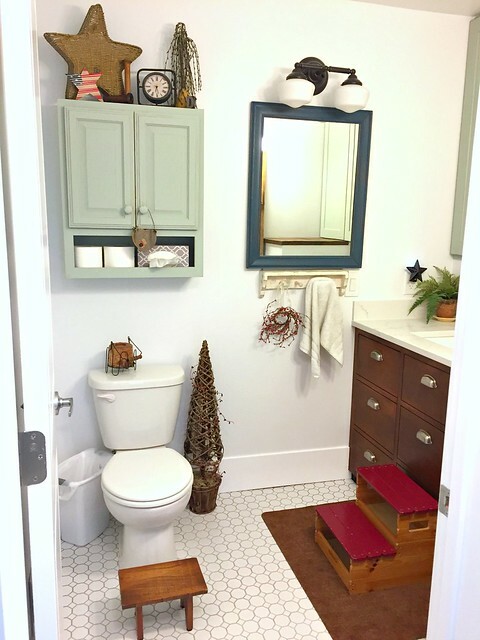 It would probably be most helpful for you to make a list of the spaces in your home and another list of the tasks you wanted to accomplish in each space — then use that as you work your way through your home. Thanks for your response. I am a pen and paper person and don’t consider my calendar printables paper clutter. It happens to be the way I function best. I will stick with what I am currently using. Thanks again. I love paper and pen, but also see benefits to having things digital and syncing as a system. Recently I started using Trello (Its free) to organize my thoughts, plans and lists. The really neat feature of the app is that you can move around items in your list plus across lists so it’s a very good system if you like flexibility. No need to rewrite anything, just move it to the right space and go on about your day. I’m a very visual person so this works so well! I took some time and thought through what an ideal (NOT perfect) system would be like. 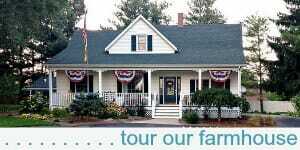 I live in the country and we have a large house, 5 kids, just recentering after a season of grief and stress. I did a Trello board with lists of DAILY items, WEEKLY cleaning and DEEP CLEAN zones (loop list). Each item of the list can be clicked on with reference stuff and checklists to keep in mind. Just wanted to share that in case anyone else finds this useful in creating their own systems. Once you do the initial work once you just tweak it to suit your current needs. I have it on my iPhone, but it syncs to your computer and I believe you could easily print it out as well. Lots of options for various personality styles. I love this idea. I just finished going through the closets in my kids’ rooms, all our children’s books, and our games and puzzles. It feels so much better to have them cleaned out. I’m going to have to breakdown our whole house into zones and give this a try. The tip about ending where the donations land so they are cleaned out before the next round begins is really helpful! I am in the middle of something like this right now. 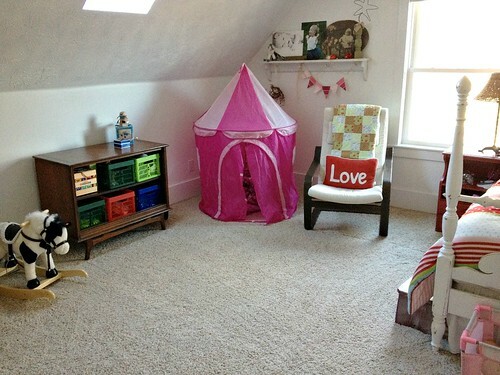 7 rooms, 7 weeks- to deep clean, purge, organize one room per week. I will be done by Easter and then I can put my focus outside the house! I could definitely see myself doing it this way again, maybe after school starts in the fall, but I probably won’t do it year round. It’s a good idea though! I find that for myself, having the continual cycle makes it easier to stick with it. If I take time off, then I “forget” to start up again — I need to stay in a routine, so the year-round approach seems to work well for me right now! I realized, as I was reading this post, that I do this too without really plotting it out. When you have a large family, there is always a lot coming in and, if you don’t always look for something to purge or clean, the work really piles up! 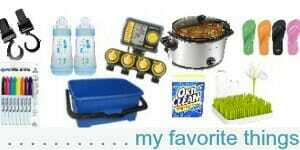 Over the last few years, I have really been trying to minimize the items in our home just so there is not so much to clean. Recently, we went through our kitchen items again and I realized that there were several items given to me that I just don’t use. That’s the beauty of decluttering regularly-you are aware of items that you have, you watch to see if you actually use them, and then you get rid of them if you realize they are just sitting there taking up space. I have gotten rid of so many pretty dishes and serving bowls that were given to me because we just don’t use them. I tend to serve out of the pots and pans that we cook in (it saves a lot of washing extra dishes). I think older generations must have put everything in serving bowls and were more formal. I cook and wash dishes all the time. I want a streamlined system. Also, I got formal china plates for our wedding 30 years ago and never once used them so I sold them. It really freed up room so that I could use the kitchen the way I wanted. Thanks, Andrea, for the great post. It’s a really good system that you have! Stephanie – I just need to learn to get rid of the guilt that seems to come with getting rid of all the serving bowls. I don’t use them either, but I have such a hard time getting rid of things!!! haha — read this post Christina! Yes, I’ve gotten rid of several sets of dishes and various other pieces from my mom, great aunt, and mother-in-law, who all love and appreciate dishes. I found that I was just storing them all and never using them (and they decided that they weren’t using them that’s why they gifted them to me). Over the years, I have sold and donated (most) items so someone else can enjoy them. I even, just recently, sold a cabinet that held and displayed some of the dishes. Now I have much more space to really use my kitchen and dining room. It feels new and fresh! yeah, I was sort of always doing something in some space in my home too — this just helps me make sure I get through the entire house and don’t skip rooms (like our bedroom)! And yes, I have the China too — I was SO excited about getting it from my grandma and I used it all the time when we were first married, but now I just like my everyday dishes and the China is collecting dust. I sold or donated all the stemware she gave me (seriously, I never used it ever) so that freed up some space, but I feel like my dishes are timeless (white with a silver edge) and I want to keep them, but I know I don’t need them or really use them. I’ve gone back and forth on this for years — obviously, I’m still waffling! haha!! I like that you consciously plan the decluttering and cleaning. You really think things through long-term. I’m older than you so I have just gotten to the point where I see I haven’t used good china and don’t plan to. We have a nice set of dishes that are more simple and modern that we use every day. When we have a large crowd over, we used eco-friendly plates and cups. I know — I think we’ll use them for larger gatherings, but then I just resort to paper or plastic to save time. I do love looking at the dishes though 🙂 haha!! sometimes, it’s just something I want or love and serves no purpose — but if it brings me joy and if I have a place to store/display it, I’m 100% OK with keeping it!